"Our routines should be so healthy that it has a good effect on our body, health, mind, attitudes and interpersonal relationships. Rituals should only be such that they would not be a burden on us. If they are a burden, the whole point of rituals is lost. The topic for the English Satsang on Sunday, 28th April, 2013 was 'Developing Faith. 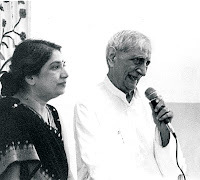 'Following is the transcript of the Q & A between the audience and Dr. Jayadeva Yogendra and Smt. Hansaji Yogendra. Check this out on ChirbitQ. My friend, a strong believer in God, lost his Ram and Hanuman Bhakta wife yesterday. He is inconsolable. How can he be helped? Dr. J: See, we can’t be calculative. This faith has to be total. There is always a test. We should have total faith, be on the right track. Smt. H: Death is something that has to be accepted in a second. When we are born, our time of death is roughly fixed. So we can’t alter that state when the person dies. We have to accept what we can’t alter. There is an example that Shastri has given, a man lost his wife, and he told God ‘I want her back, give her to me.’ She was brought back to life. But even after that, she got paralysed, then had heart trouble and suffered. Her life was so miserable that she was better off dead. The man realized that what God had done was right. So it is better to think that whatever happens, happens for the good. Another story I had read said that a child had died and everyone in the village was crying. A saint passing from there was laughing. When asked why, he said that ‘You are burning his body here, but the child’s soul has already taken birth somewhere else and he is going to be a great person. So this is a moment of joy, not sorrow.’ So he could foresee and so didn’t see death as a matter of sorrow. So these are stories that show us that we have to just accept. We feel pain, but try and remember the person fondly. If some person goes to America, he is not physically there but we are fine. So in the same way, we should look at death. Accept and start getting back to your work. The topic for the English Satsang on Sunday, 28th April, 2013 was 'Developing Faith. 'Following is the transcript of the speech made by Smt. Hansaji Yogendra on the topic. Check this out on Chirbit“With faith, man can maintain his balance of mind and is able to perform his duties. But this faith doesn’t come easily. When a child is small, it has faith in parents. But as and when the ‘I’ sense increases, he starts thinking for himself and faith in parents goes away. As we grow older, we think we know more than our parents or more than everybody.So we are born with faith. A child has faith that he will get nutrition from the mother and its life depends on it. But as the ‘I’ sense increases, faith is the main thing that reduces and we don’t even realize that our life becomes like an anchorless boat. If the wind blows it one way it will sail in that direction, if the wind blows the other way, the boat will sail in that direction. So steadiness of mind disappears. We get angry or worried at any small thing. There is no faith in our lives anymore.